The Mitsubishi Motors display Sunday at the 2019 NADA Show. 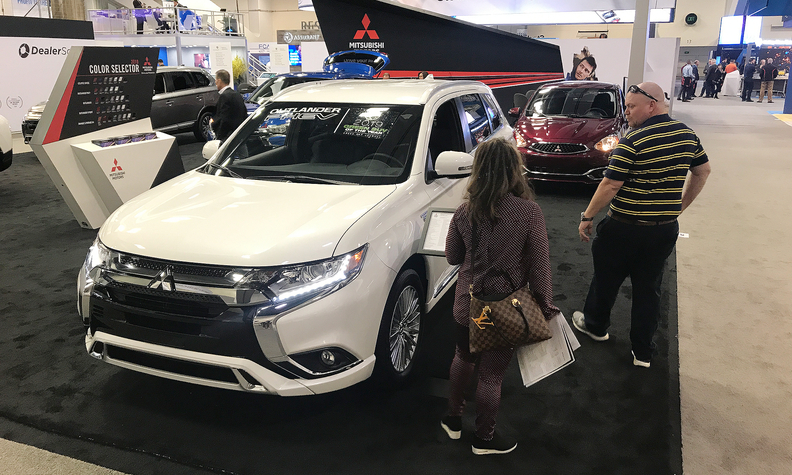 One in seven U.S. Mitsubishi stores will undergo upgrades as part of the automaker's new dealership image program that also includes financial support for completing exterior requirements, a Mitsubishi executive said Sunday at the NADA Show. Fifty of the Japanese brand's roughly 355 U.S. stores have agreed to the upgrades, Mark Chaffin, COO of Mitsubishi Motors North America, told Automotive News following the brand's make meeting with dealers. Dealers who fulfill six elements of Mitsubishi's exterior image program will receive a subsidy from Mitsubishi Motors, Chaffin said. He declined to comment on how much dealers could receive. Mitsubishi last had a store improvement program in the U.S. in 2000. The new, worldwide facility rollout includes a black decorated exterior and a diagonal "Dynamic Slope" on the facade. "When dealers see the new visual identity go up, and the impact that's going to have on those dealers in terms of bringing more customers in and improving the customer experience, we have a pretty strong feeling that's going to give these guys a good business case to follow suit," Chaffin said. R.C. Hill, a DeLand, Fla., Mitsubishi dealer for 15 years, said he was awarded a second sales point last year and plans to spend $6 million on a new store in Ocala, Fla., that will feature the brand's new facility design. That store should open by year's end. Hill said he is setting himself up for a strong future he sees with Mitsubishi in the next two to four years, behind brand growth and more product. "One of the focuses right now with Mitsubishi is customer experience. And Mitsubishi dealers are pretty overdue for facility enhancements," he said. "It's something that I think we need to commit to do. Each dealer's timing may be different, but eventually we'll get there." Mitsubishi's U.S. sales rose 14 percent last year though deliveries remained low at 118,074 light vehicles, making it among the lowest mass-market volume brands in the market. Chaffin also discussed with dealers the brand's growth plans, which include adding 32 new dealerships in the U.S. in the current fiscal year that ends March 31. Mitsubishi also is looking to add more dealerships in markets such as Los Angeles, New York, Houston and San Francisco, he said. Chaffin said establishing a leasing product is also a priority for management and it has made some improvements to the dealer ordering system over the past few months. Some dealers have complained about the lack of a leasing product and a 90-day ordering system. "The big message to our dealers today is about us executing a transformation plan where we're combining our new products, a strengthened dealer network and an improved customer experience to sustain our growth and to grow our brand in the years ahead," Chaffin said.